Total tooth loss can be devastating. Every aspect of your life can be negatively impacted by advanced tooth loss. From speaking clearly to sharing a smile, you may find yourself struggling to complete even the most mundane tasks. The team at Milwaukee Dental Implants is here to help. 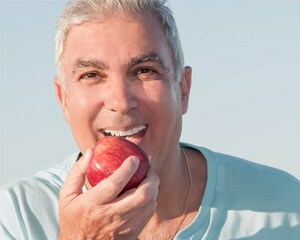 Whether you’ve lost a single tooth or a full row of teeth, our team uses the most innovative dental techniques and technologies to deliver healthy, functional smiles, including All-on-4 dentures for complete tooth replacement. If you’re ready to schedule a tooth replacement consultation, call our dental office in Milwaukee to get started today. The team of skilled specialists at Milwaukee Dental Implants will partner with you to create a dental implant supported tooth replacement plan to deliver your healthy, happy smile. 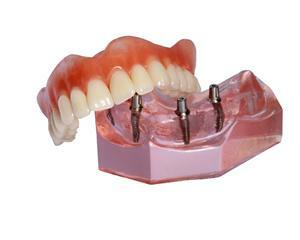 Traditional dentures are crafted using a gum-colored base material to provide support for a row of replacement teeth. Without any remaining teeth to provide support for the denture, these prosthetics were crafted to fit against the gum line, creating suction between the gums and denture that provide adequate stability to allow you to speak clearly and smile confidently. For increased stability, dental implants can be used to replace missing tooth roots and anchor the denture. Traditional implant dentures use four to six dental implant posts strategically positioned along the jawline to support the denture. All-on-4 dentures use four dental implant posts uniquely positioned to support a full denture, using the naturally denser parts of the jaw to minimize the need for advance preparatory tissue grafting. Relatively good oral and overall health and/or approval from general physician to undergo minor surgical procedures. No negative past experiences with surgical procedures or poor reactions to anesthetic administration. Able to make the time and financial commitment to complete the complex, multi-phase All-on-4 tooth replacement plan. Simple treatment – the innovative treatment plan means that most patients don’t need the complex and invasive bone or soft tissue grafts that are often necessary for traditional implant supported dentures, making the entire process faster and easier. Improved results – the All-on-4 denture process leads to long-lasting results that feel and function like your healthy, natural smile with diminished risk for implant failure. 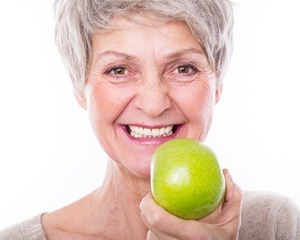 Once in place, your All-on-4 denture will restore 70% or more of your healthy chewing function, and your denture will last for two decades or longer with proper care. 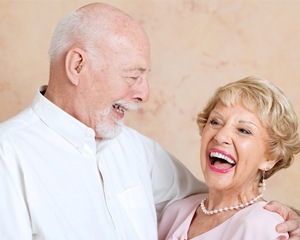 Complete confidence – the fully self-supporting All-on-4 dentures will give you the confidence you need to share a smile, eat a meal, and speak clearly in any situation. While traditional dentures are crafted to fit over the top of four to six implant posts that are positioned along the jawline to support the tooth replacement prosthetic. Rather than placing implants across the jawline, the unique All-on-4 denture process offers the same stable and long-lasting results possible with traditional implant dentures, utilizing a simplified process that takes advantage of your natural dental structures. Two implants are placed vertically to support the front of the denture, and the other two implants are positioned diagonally to support the back of the denture while implanting into the naturally denser structures in the front of the mouth.